Today run was like last week run. I ran from my home to Tasek Lama via Sg Akar highway and Jalan Kebangsaan. This time instead of entering Tasek Lama, I entered Bukit Salilah near Sheraton and used the back road - trail running to Tasek Lama. It was an exhausting run especially the offroad running. ** No cycling this week. Basically I'm concentrating more on my running - building up base running (foundation & endurance) for my ultramarathon. 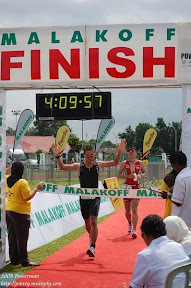 I wish more Bruneian will participate coz if I can do it, for sure those faster & have more endurance than me can do it. My first swim lesson was last Tuesday afternoon at Anggerek Desa Swimming Pool. It was supposed to be at Pusat Belia but the pool is under renovation. The lesson for that day was correcting my strokes and my strokes was way out of tune - patutlah inda laju. My stroke length was shorter, it should be longer. When I went for a swim yesterday, it shows a lot of improvement and I seems to be swimming faster and efficient compare to my shorter stroke style. Most probably I'll take another 5 to 10 lessons before I stop. I guess most of you would be thinking - inda membari malu kah belajar swimming sudah tua tua ani, arah public swimming pool lagi? Ada lah sikit sikit but if you want to improve, peduli apa kan malu. I'm the one getting better, the other people pandai pun inda swimming, beramdam ganya. think about it. Last Tuesday, in my class there were two students. One was me and the other was a small girl (5 to 8 years old) belajar freestyle. Keep on practicing................perfect strokes makes perfect swimming.